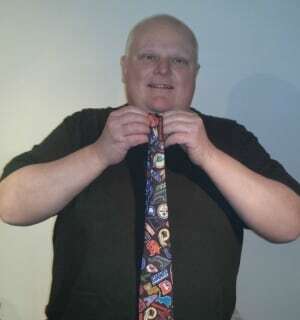 The price of owning the tie Rob Ford wore on the day he first admitted to smoking crack cocaine is $16,100. That was the winning bid listed on Ford's eBay page, when bidding ended just after 5 p.m. ET Wednesday. The city's former mayor and current Ward 2 councillor has been selling off some of his belongings on eBay. His crack-confession necktie went up for sale on the auction website a week ago. Ford is also selling a coat he wore as a football coach, several sports jerseys and a familiar-looking sweatshirt. But so far, the bidding for those items has not been close to bids placed on the tie.